This session last Sunday covered the seventh segment of the Wild Goose series where we focused on The Spirit of Adoption. As Pope Francis explains that the Holy Spirit creates in us this new condition of being children of God (General Audience, April 10, 2013), Father Dave Pivonka similarly elaborates through the video that the spirit of God eliminates fear in us, allowing us to experience a genuine Father-Son or Father-Daughter relationship with Him. This spirit allows us to cry out to our father with the word Abba – a very intimate way to address our Creator; in a more human sense, it brings to mind a little child running to welcome their father from a long time away on the battlefield. God is not looking for soldiers or slaves but looking for an intimate relationship with His children who will dance in delight of being in His presence and embracing His Spirit. In biblical times, the word “Abba” was never used amongst the Jews – The Jews had a problem with Jesus because of the intimacy with which he spoke of God. Some other religions may not be familiar with this kind of relationship as they do not refer to God as Father or as someone who we can confide in freely and totally but as only a supreme master to which they are mere slaves. How would we feel if we were adopted? In Roman law, the adoption process was very intricate and could even be described as cumbersome because of the many steps before its completion. The adopted person was expected to change name and become a completely new person; even his debts were written off! All the same benefits that were given to an original family member were accorded to an adopted person including heritage, inheritance, blessings and gifts. And according to the same Roman law, you could not return the child if he/she was not what you expected on basis of gender, health or even birth defects because you made a choice and you knew what you were getting into. In adoption today, it is deemed that you are aware of the child’s history including all ailments and conditions and as a parent, you are not allowed to return that child because you signed that you will protect, love and cherish based on what you already know about that child. God, our Father in heaven cherishes His relationship with us and although we pay reverence on earth as children, we also serve Him in fulfilment of a purpose-driven life. He will not forsake us or abandon us regardless of our iniquity or shortcomings provided we constantly repent and restore our relationship with Him. Q: What is your primary image of God and how do you relate to him? How is God personal to you? How do you approach God? Like a slave approaching the master or as a child approaching the Father? A: People shared that their primary image of God was that of a supreme Master which has evolved to one in which a childlike trust subsists; this creates the urge to make daily discoveries about Him through studying scripture more. We relate to God through Mass or through showing love for people which could result in having a more intimate prayer life. Most people expressed that they approach God like a child would approach a father and engage in personal communication with Him. Through such a relationship, we are led to reason that when we ask God to fulfil something in our lives and we don’t get it then there must be a particular reason as we should embrace our seasons according to God’s plan. Q: There is an innate desire in each of us to be chosen. We have been chosen by God and God’s Spirit wants to place this reality on our hearts. Discuss what it means that God, knowing everything about you, has chosen you as his adopted daughter or son. A: God loves each of us in a unique yet equal way; He doesn’t love one person more than the other. No matter what wrongs we commit and regardless of our family background, He has chosen to love us unconditionally. 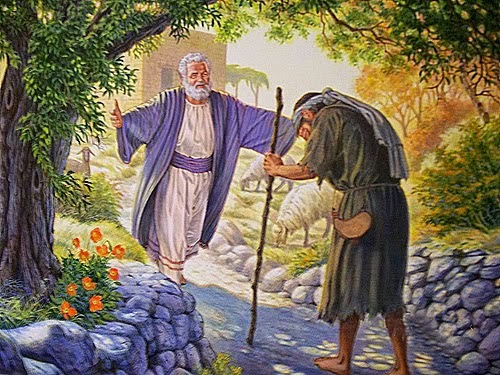 A true example of unconditional love is seen when a parent does everything for a child who may never be able to pay back just like in the parable of the prodigal son (Mathew 21: 28-32); this is the same way God loves us as His children unconditionally. Q: It has been said that our relationship with God the Father begins with our earthly father. Discuss how God is both like and unlike your earthly Father. A: Throughout our lives, we seek direction from our parents in certain situations. However, we discussed how human validation from our earthly parents may not grant us the same satisfaction as our Father in heaven. When seeking for answers to peculiar challenges, we may find more recourse in the steps that are ordered by God because ultimately, He has the perfect answers and the timeliest promptings. God loves us personally and we pray that as we continue to grow in relationship with His Holy trinity, we may come to the realization that we are His true children regardless of any difficult circumstances we experience in life. If you have any specific issues you would like to discuss with a neutral party or are looking for spiritual direction on any issue referenced in this article, please send an email to info@youngandcatholicng.com to receive help. This is a time to remember that the divine mercy gushing forth from the bosom of our Saviour Jesus Christ, is endless and is available to us as long as we continue to seek it. Will you join us at our next session?